The MegaCold Water Vapor Cryopump provide the most cost effective solution for vacuum pumping water vapor in a vacuum system, dramatically reducing pump down times and significantly improve product quality. In production applications, this means more cycles per day. In most cases 50- 100% throughput improvements are achievable cutting pump down times in half . The MegaCold works on the principle of Meissner trapping. Water vapour is captured by condensing onto a cryogenically cooled surface (a cryocoil) that is placed inside the vacuum chamber. With this design/equipment pumping is not limited by the size of pumping ports. 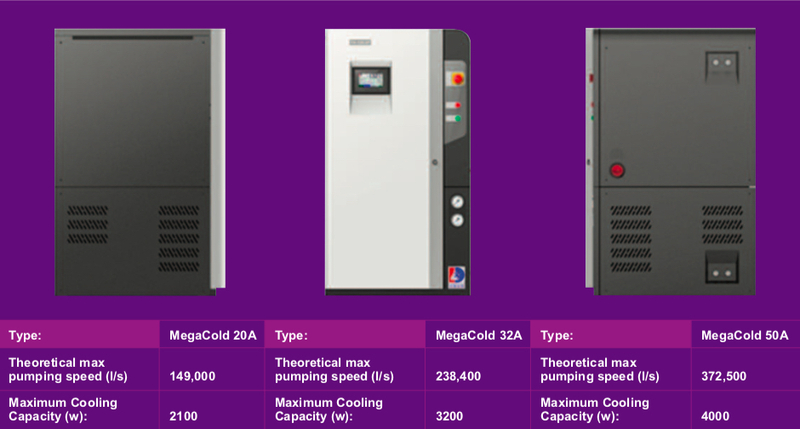 The MegaCold is controlled by an industry standard PLC with a touchscreen local interface. The MeagCold also has a full set of remote options available. The equipment is available in single & dual output cooling circuits options, giving independent control over a cryocoil and baffle..
1. In chamber pumping speed of water vapor from 100,000 l/s to 350,000 l/s. Using the MegaCold units, the trapping is done by the coils inside the chamber, thus flange size is not a limiting pumping speed factor. 2. MegaCold systems have regenerative heating capability, thus regeneration is quick, easy and casually be accomplished during the loading of product. 3. Addition of a MegaCold can cut the pump down time to base vacuum by 50%. 4. 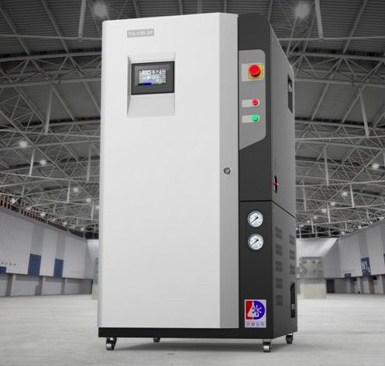 Since 90% of outgassing in the high vacuum regime is water vapor, addition of a cryopump chiller is the most effective use of vacuum pump dollars. Competitor Model Matrix- Which MegaCool Model to Replace Current Water Vapor Cryopump? Needing service for your Polycolds or Telemark? The cryocoil will be designed to fit the specific vacuum chamber. We can design and fabricate a coil for a certain area of the chamber wall. This is important for existing chamber systems. 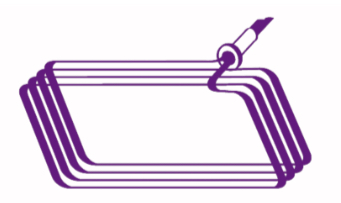 Coil design is based on information you supply, or you may choose to design and build your own cryocoil. Typical cryocoils have helical, spiral, serpentine or other simple shapes. The standard cryogenic feedthrough provides isolation between the outside atmosphere and the vacuum in the chamber between the feed/return tubes and the O-ring seal. The dual pass feedthrough requires a two-inch diameter hole in the vacuum chamber. A standard refrigerant line set consists of a copper feed & return line, each with stainless steel couplings on both ends for connection to the MegaCold unit and to the feedthrough. The black outer foam is to reduce/prevent frost build-up on the coil. Vacuum insulated lines are available if required due to long runs. Standard refrigerant line length is 8-10ft.